There can be few topics on the higher education landscape more controversial than Massive Open Online Courses, or MOOCs. While some believe they represent the very ideals of education for all, and a logical extension and future for the campus, others doubt they can take the place of more traditional learning. Both of these viewpoints were endorsed recently when Inside Higher Ed presented their 2013 Faculty Attitudes on Technology survey. Conducted this past summer by Gallup, the survey collected the views and opinions from 2,251 college faculty members and 241 academic technology administrators in an analysis of technological issues as varied as LMS usage, Lecture Capture and adaptive learning techniques. 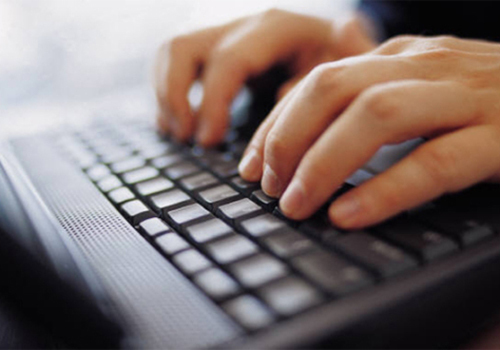 It was the question of MOOCs, however, which proved the most controversial. 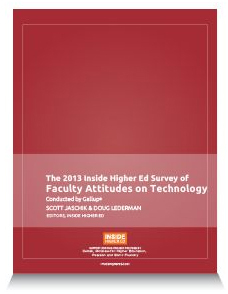 The 2013 Inside Higher Ed Survey of Faculty Attitudes on Technology. Conducted by Gallup. Overall, the mood of this year’s survey was one of skepticism on the subject of online learning, and this was especially evident concerning quality and the kinds of controls university faculty might be able to exercise on how the courses were administered and used. Only 1 in 5 of the professors surveyed believed online learning courses could obtain the same learning outcomes as in-person traditional courses. But some campuses have already embraced some form of online learning into their own curricula, and attitudes softened somewhat where faculty members had first-hand experience and were more appreciative of the benefits offered. A third of those who had taught online courses believed they could produce the same learning outcomes as in-person courses. Year over year, the number of professors surveyed who had taught a digital course edged up only slightly from 25 percent in last year’s survey to 30 percent. “It’s slow growth,” agreed Inside Higher Ed Editor, Doug Lederman, “but over time, we are seeing an upturn in appreciation for the quality of online education from those who are teaching it.” There were other concerns about the quality of online courses, and these included anxieties over accreditation, independent certification for quality, the qualifications of those teaching online courses, and whether or not online courses were offered alongside traditional in-person instruction. The singling out of MOOCs for particular scrutiny above other forms of online learning technology may be a response to how quickly this area of the industry is developing. “MOOCs have captured a very high level of attention,” pointed out Inside Higher Ed Editor, Scott Jaschik, citing President Obama’s recent mention of them in helping facilitate college affordability. “And some of that may be reaction to the hype rather than the reality,” he added. Further clouding the issue is the growth of MOOC-like programs, built on the same model, but not always entirely open, or entirely free or entirely online. The survey itself pointed to a meager 5 percent of faculty who reported they had never taught a face-to-face course while 4 in 10 (or 39 percent) of respondents confirmed teaching a blended or hybrid course. As institutions such as Stanford, Harvard, MIT and others start to embrace digital learning, the industry in general still seems to be only partially convinced of its value, or of a workable method to introduce it to their campus. Opportunities for online learning may exist to help relieve capacity for higher demand, or the ability to serve remedial, introductory education or at-risk students in a lower cost model. But ultimately, the future of digital learning may not rest solely with college campuses, but will also be influenced by the greater workforce. 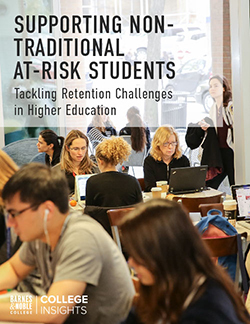 Shortly before the Inside Higher Ed survey was published, Public Agenda, a nonprofit, nonpartisan organization released their own poll of more than 600 employers in four major cities. Their findings, including the outcome that 56 percent of employers prefer an applicant with a traditional degree from an average college to one with an online degree from a top institution, and that only 7 percent said they would prefer an applicant with an online degree, are crucial to the future of online learning. It’s those kinds of reactions that might more accurately predict the future of technology, and how best to guide it in the attainment of a quality higher education.